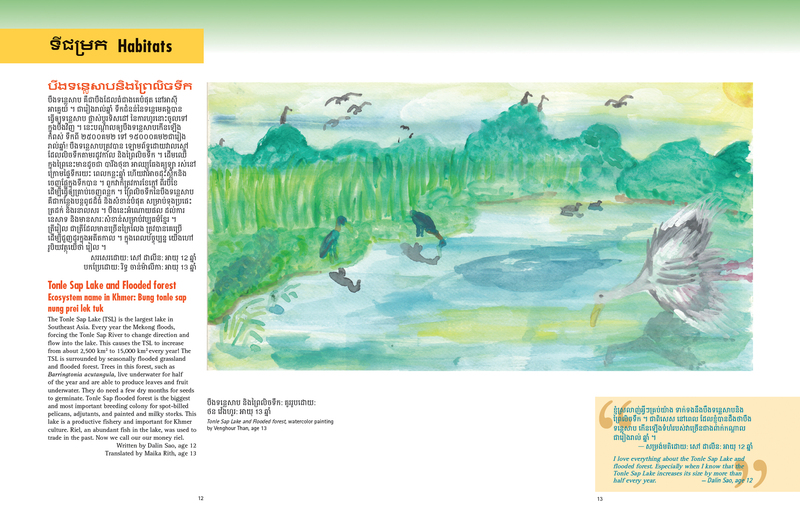 The Illustrated Guide to Wildlife of Cambodia is a bilingual book entirely researched, written, and illustrated by the students of Liger Learning Center in Phnom Penh, Cambodia. The book details 87 vertebrate species and 7 ecosystems. Beautifully visualised and scientifically accurate, it is the first record of its kind for this part of the world. All proceeds from this campaign will go to printing and distributing the book to school libraries all over Cambodia. The Illustrated Guide to Wildlife of Cambodia is the result of an immense journey of discovery that took course over two years. The book is authored by 13 students and includes contributions from 50 Liger students, ages 10-13. It began with research. 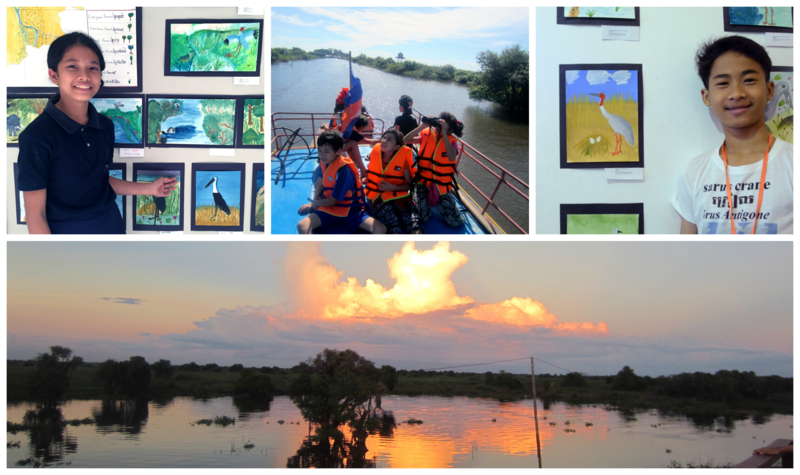 Liger students traveled throughout Cambodia to participate in forest ecology and zoological projects. Adventurous destinations included the Seima Protected Forest in Mondulkiri, the northern plains in Preah Vihear, and the evergreen forest in Koh Kong. "On these trips, the world was our classroom," says Liger Learning Facilitator Jojo Hart. "The students were delighted to discover animal tracks in the forest, to see a smooth-coated otter in a mangrove, and to hear the loud wing beats of the great hornbill." These trips fueled the students' passion for Cambodian wildlife and conservation and earned them a strong understanding of taxonomy, animal behavior, ecology, and Cambodian geography. They grew closer to one another grew to love and appreciate the wild places and the creatures that depend on them. Liger collaborated with NYC-based NGO Art in a Box to teach the kids how to create watercolor illustrations and design the book. Art in a Box partners with disadvantaged communities around the world and assists in recovery and empowerment through art. 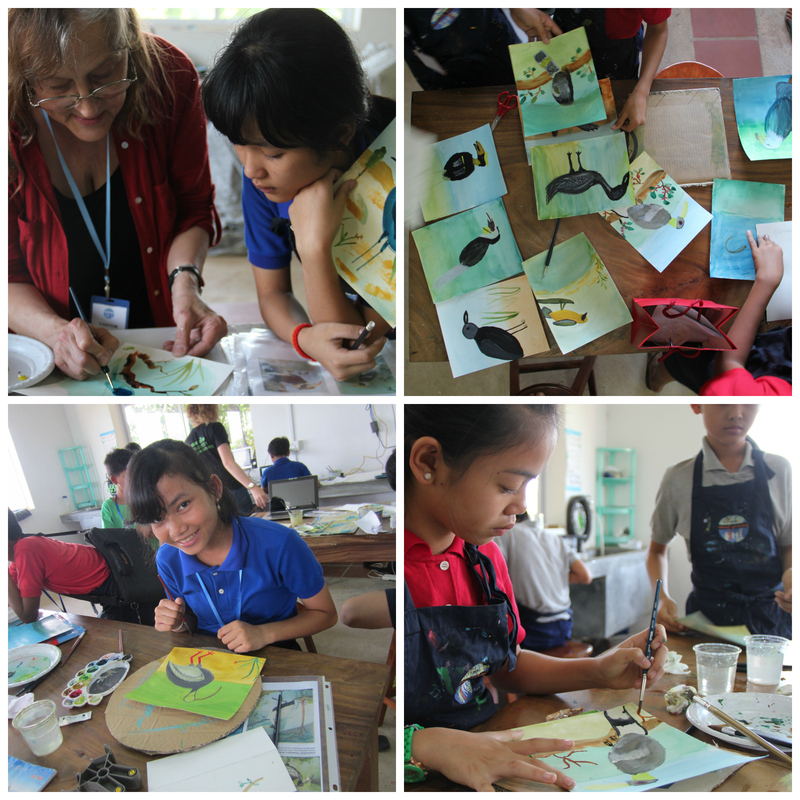 Art in a Box’s Val DuBasky traveled to Cambodia and spent two months with the Liger students leading a course on watercolor and natural history painting. As their confidence grew, the student illustrators began to achieve visual expressions of more complex ideas: How to paint water. How to paint fur, feather, or scales. In the end, they had discovered how to create art that combined scientific observation with creative self-expression. This project incorporated many subjects including ecology, biology, geography, and art. It also included invaluable growth in the students' English literacy and Khmer literacy skills. "Just a few years earlier, none of them spoke English nor had touched a computer. 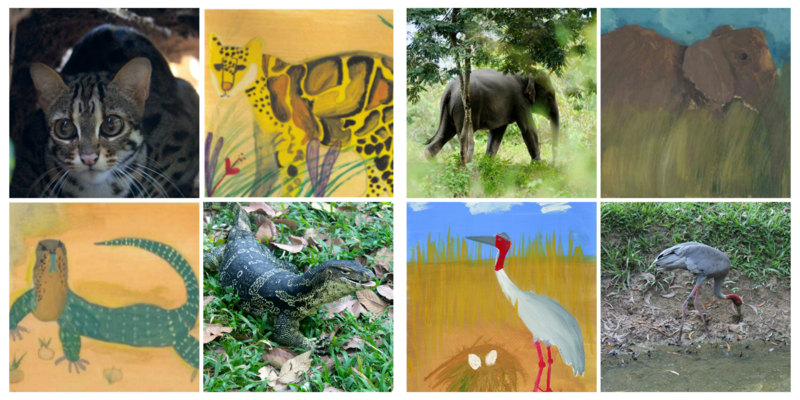 And now they've created the first reference work on Cambodian wildlife created by Cambodian children." - Trevor Gile, founder of The Liger Charitable Foundation. Each species description involved at least four rounds of editing, conducted by the students, Liger staff, and a mentor from Cambodia, the USA, or Poland. All 50 Liger students worked together to provide accurate and informative Khmer translations. Wildlife Conservation Society (WCS), whose mission is to save wildlife and wild places worldwide. They do so through science, global conservation, education and the management of the world's largest system of urban wildlife parks. Fauna & Flora International (FFI) Cambodia, whose mission is to act to conserve threatened species and ecosystems worldwide, choosing solutions that are sustainable, based on sound science and take into account human needs. Sam Veasna Center, who provides an alternative sustainable livelihood from ecotourism for the local communities at WCS conservation sites. Free The Bears, whose mission is to is to protect, preserve and enrich the lives of bears throughout the world. Angkor Center for the Conservation of Biodiversity, who aspires to become a focal point for wildlife conservation and environmental activities throughout the northwest of Cambodia. Each week of our campaign, we'll update this section with a funny or meaningful anecdote from our experience creating this book. 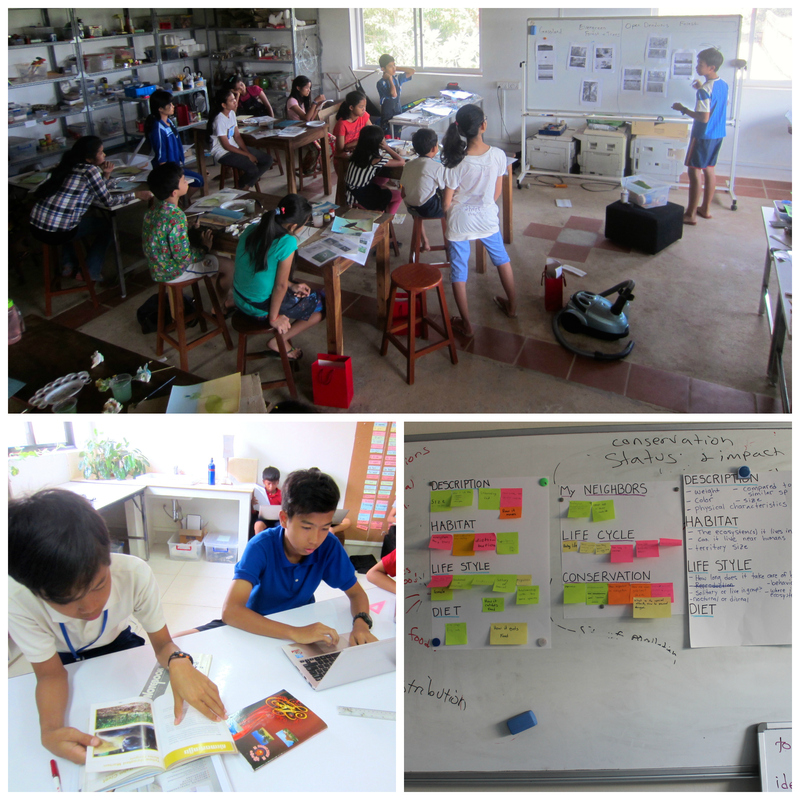 Week 4: This week’s story is about quick-thinking, ingenuity and appreciation from wildlife book authors Sythong and Niron. Sythong: We were on a boat in Prek Toal flooded forest, in the protected bird sanctuary near Siem Reap. We have to climb up a tall tree to see through the binoculars from the platform on the top, four meters up. We wanted to see the storks, egrets, herons and other water birds. Niron: There was some problem with the ladder so we needed to climb up the tree. I was having a little vertigo and was so scared. I was holding my journal but I had to hold on to the tree and my book fell! I felt I cannot do anything, only watch frozen as it fell into the water. All my drawings and research and facts about my species. Sythong: “I can go to get it!” I yelled, and started to climb back down that tree. I reached for the book but I cannot get it. So I pulled down a vine, a dead vine, and use it to pull that book back. Niron: Everyone was cheering and my book was saved! But the pages were stuck together from the water. We dried it page by page on top of the boat. I was so happy not to lose my hard work. What is the Liger Learning Center? The Liger Learning Center is a privately-funded residential academy with a core focus on three main themes: leadership, entrepreneurship, and social awareness centered around the challenges facing the country. Liger students are selected exclusively from impoverished backgrounds and chosen based on their potential. The first LLC is located in Phnom Penh, Cambodia. The Liger Charitable Foundation is proud and honored to be making long-term investments in these young people who are already achieving amazing things, this book being just one of them. Our students are the bright faces of a future Cambodia. 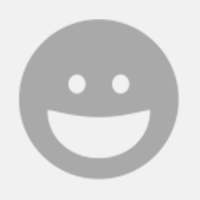 We welcome you to learn more at: ligerlearning.org. Liger works closely with the Cambodian Ministry of Education and Minister Dr. Hang Chuon Naron, who has requested that copies of multiple Liger publications be placed in all of government school libraries. The purpose of this campaign is to fund the local printing of the book to be distributed to school libraries all over Cambodia. Every dollar raised by this campaign will go to this cause. Purchases of the US printing does not benefit this cause. The Liger student authors understand that the youth of today are the future stewards of their country. They hope that with this book, kids (and grown-ups!) around their country will discover furry and feathered neighbors they never knew they had, improve their English and Khmer literacy, and be inspired to protect Cambodia's endangered wild places. The Ministry of Education, Youth, & Sport has requested copies of the book to be placed in all of their schools. With $3000, we can reach half of the schools - that's approximately Five Hundred Thousand Children! Reaching half of the government schools is enough to make an impact, but you never know which child will someday be in position to make a difference. We don't want this book to miss him or her. That's why reaching our Stretch Goal is so important. With $10,000, we can print and distribute the book to every single government school library in Cambodia. That means over 1 MILLION KIDS would have access to this beautiful and important work. Liger's aspirations to improve education in Cambodia don't stop there. Our first book, The Cambodian Economy - a textbook written by kids, for kids - has also been requested for distribution throughout the country's schools. Minister of Education, His Excellency Dr. Hang Chuon Naron personally endorsed the work and wrote a stirring forward. Additional funding is still needed to meet our distribution goals. Another major publishing endeavor is the Liger Science Series, a collection of 25 (!!!) science storybooks written and illustrated by Liger student pairs. From the solar system to the immune system, each book teaches a fundamental science lesson while also telling a fun and entertaining tale. The books are in English and Khmer and were created to address the lack of science material available to Cambodian youth. The Phnong Indigenous Minority photo book is yet another Liger original. Liger students spent 7 weeks researching, interviewing, and living with the Phnong, an indigenous minority ethnic group that has existed in Cambodia's eastern forests for over 2,500 years. As their lands are threatened and traditions get watered down, this book is an important historical document of their lives, livelihoods, and animist beliefs. There's more. Two Liger students are finishing up a fantasy novel, written in Khmer, with strong female protagonists. They hope to get more young girls interested in reading and fill a gap in Khmer-language fiction written for kids. Another team of Liger kids have also begun a Local Libraries program. They designed, built, and stocked nine mini-library boxes and installed them in various locations around Cambodia. Their hope is to create a total of 30 boxes and place them in rural areas where the nearest library may otherwise be 100s of kilometers away. They hope to expand literacy in rural Cambodia but need funding for building materials, distribution, and books. In the future, Liger is planning a book on Cambodian Geology, another book about Marine Life, and a board game teaching fiscal responsibility,. All of these projects add up to a need to launch Liger Publishing. Any money raised beyond $6000 will go towards getting these other important projects off the ground. Virtual moon-bear hug and our thanks! Receive a personalized scientific animal nickname in a special thank you email from Liger students! Receive an MP3 of Liger's original Thank You Song! + a personalized scientific animal nickname in a special thank you email from Liger students. A personalized postcard from our students sent from Cambodia to your front door featuring art from the book! Receive your very own copy of the 1st edition Cambodian printing of The Illustrated Guide to Wildlife of Cambodia! 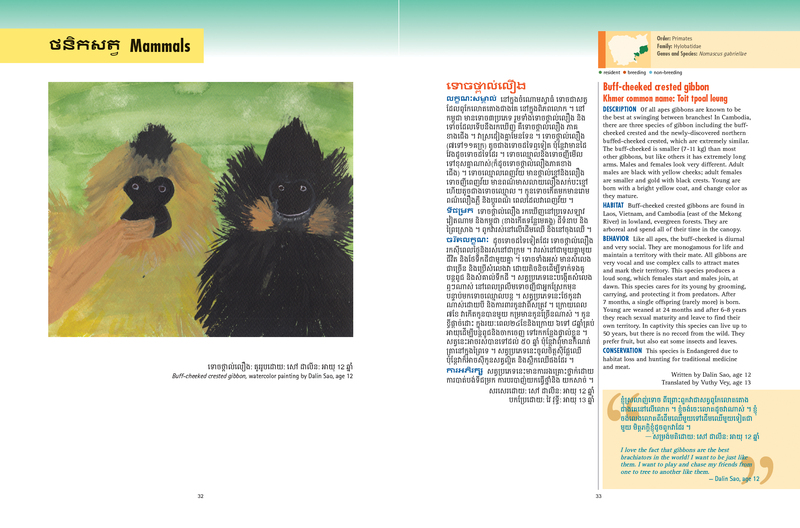 Receive your very own copy of the 1st edition Cambodian printing of The Illustrated Guide to Wildlife of Cambodia -- autographed by the student authors! AND a copy of the 1st edition Cambodian printing of The Illustrated Guide to Wildlife of Cambodia -- autographed by the student authors! + an MP3 of Liger's original Thank You Song. You'll be invited to visit the Liger Learning Center here in Phnom Penh (travel costs not included) OR an exclusive Skype-session with the student authors, who will thrill you with amazing animal facts and stories about growing up in Cambodia. + your very own copy of the 1st edition Cambodian printing of The Illustrated Guide to Wildlife of Cambodia -- autographed by the student authors. + your very own, one of a kind, original watercolor painting by the student illustrators. Liger will book you a round-trip flight (economy class, one ticket per donation) to Phnom Penh. Visit the Liger Learning Center and meet the students! Complimentary stay on the Liger campus, including traditional Khmer meals, for three nights. + a limited edition Wildlife Guide t-shirt featuring beautiful art and fascinating facts from the book. + your very own copy of the 1st edition Cambodian printing of The Illustrated Guide to Wildlife of Cambodia -- signed and inscripted before your eyes by the student authors. + THREE original watercolor paintings of your choice!